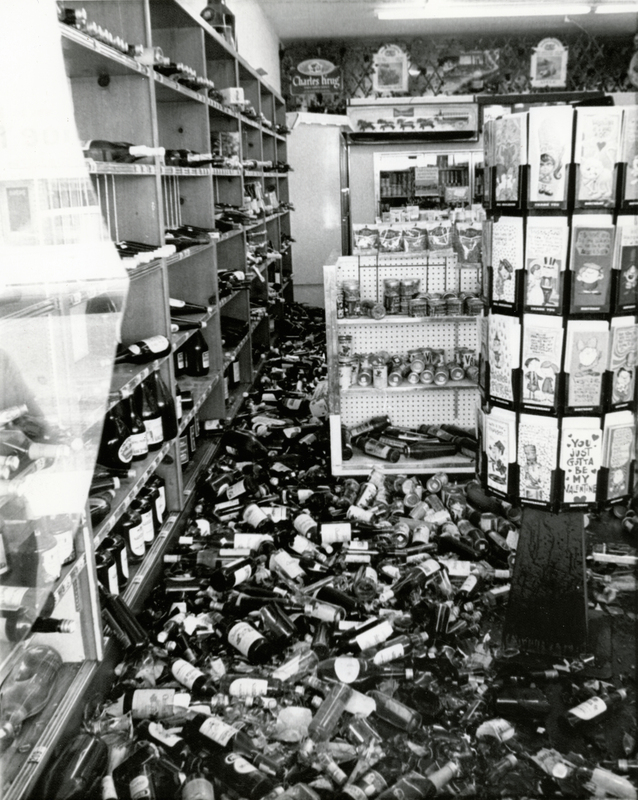 SCVHistory.com LW3019 | Sylmar-San Fernando Earthquake | Damage in Liquor Store, 2-9-1971. Next-day Associated Press wire photo, 8x10 inches, showing damage in an unidentified store as it appeared on Tuesday, Feb. 9, 1971. A jumble of liquor bottles littered the floor of a store in Newhall Tuesday after an earthquake jolted the southern California area. The quake centered near Newhall, about 40 miles north of Los Angeles. According to members of the Dillenbeck family (pers. comm. 2017), who ran grocery stores in Newhall and Canyon Country at the time of the quake, another newspaper that published this photograph identified it as Milan's Liquor and Deli at 8534 Foothill Blvd. in Sunland — not Newhall. LW3019: 9600 dpi jpeg from original photograph purchased 2017 by Leon Worden.